What camera do you use? - SolarChat! Just wanted to ask what camera everyone is using for their solar work? I am still using the Flea (see in signature) and it's such a great little performer with its decent resolution and high framerate! Re: What camera do you use? I use an ASI 174mmfor fl above 1000mm and now testing an ASI 1600mm for shorter fl. Let me know how the 1600MM goes, would like to see how it performs! I use a PGR IMX249 chipped camera (5,86um pixels) for longer focal lengths and a PGR Chameleon 3 (3.45um pixels) for shorter focal lengths. QHYIII 174 for long focal lengths, ASI1600MM for Lunt 80. Lots of Newton rings with the 1600, but cured with a Daystar Interference Eliminator. Interesting. I am also using at the moment an ASI 1600MM Pro with my new Quantum filter, have not had yet the WOW moment,. I also have huge amount of Newton rings. Please explain that Daystar Interference filter. Perhaps I need to buy one. I already tilted the 130mm ERF in front of my Takahashi TOA but that did not help. Will try tilting the camera. One more question. Which image acquire software are you using ? Is it possible to adjust Gamma, Contrast and Brightness on an ASI 1600MM ? I have SharpCap and ASICAP but on boith software I have not seen these adjustments. I use FireCapture and it does allow you to adjust gamma, gain, brightness, exposure, binning, and all the other usual settings. I am not sure why you don't see them in SharpCap, I haven't used it but I would think those are fairly standard. You are not using a generic webcam camera driver are you? Double check that you have the ZWO drivers installed and selected in SharpCap. ASI120MM-S: fairly good cam but small sensor size, and gives a lot or NR's. Needs a lot of tilt to get rid of these. Advantage: it is the only ZWO camera I know where high-speed mode does not influence quality. (Has only a 12 bit ADC used in both high-speed and low speed modes) At full resolution that gives 70fps. Works very well in white light or planetary. In full resolution abd 14bit ADC gets around 30fps if you have a good USB3 and fast SSD for recording. Think it depends. At some stage ZWO disabled gamma adjustment in their library. Can't blame them because this was a software adjustment and only slows down things and does not do anything you can't do later in post processing. The only thing that is sure is that you LOOSE information in the captured data. So depending on which version of ZWO library / capture software version used it might be there or not. Has anyone tried the ASI178mm (2.4um pixels) for a short focal length Ha scope? I've been trying my ASI174mmm on a solarmax II 60 and its not working well. I think the pixels are I think just too big for decent resolution at that f/6.7 ratio,. and I;m looking for small pixel option, preferably under 3um. The ASI174mm works well with the longer f ratio of my my Quark setups. Location: Bay of Plenty, New Zealand. 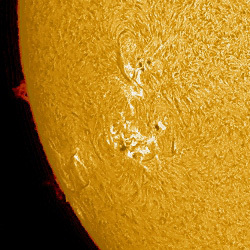 Solar Ha setup: Daystar Ha Quark, Coronado SMII 60 DS BF15, McDougall Solar AutoGuider. Skywatcher ST80, WO ZS66 SD, and Nova 102mm f/6.5 achromat refractors. Other scopes: Celestron C8 and C11 on AVX, 8SE, and CG-5 mounts. Cameras: Celestron Neximage Burst Mono, ZWO AS120MC, ASI174MM, ASI290MC, Canon 60D, Celestron Nightscape CCD, Astro-Video MkIV. I tried the ASI 183MM with the smaller pixels and had “issues” which Was acknowledged by ZWO an not being suitable for narrowband Ha solar...they offered a refund and I replace it with the ASI 1600MM which seems to be working well for me. The ASI 178 has the same pixel size as the ASI 183MM but I haven’t heard of the same problems. Thanks. Well I have also a Quark chromosphere and before inserting the ERF I had newton rings. After adding the ERF inside the telescope they disappeared. That is why I thought it would help. Will have to see how I solve that Newton ring problem. AsiCap and SharpCap I also ahve there the latest versions. In noe of the programs I do find the contrast adjustment. Anyhow I managed to get my Infinity cameras onto the rear of the Quantum and will try with the very old but very reliable software Lucam Recorder which has Gain, Gamma, COntrast and Brightness adjustments. Unfortunately Heiko Wilkens the author of the software abandoned the development and so I can only use TIS and Lumenera cameras. for contrast: firecapture has PreProcessing filter to make contrast changes. Gamma now seems to work again (maybe ZWO introduced it back? Brightness can be found in "More" menu. A Point Grey Research Grasshopper 3 with a mono Sony IMX 174 sensor. The IMX 174 has a 1/1.2” sensor format with 5.86u pixels.